Our most festive menu for a truly unforgettable event. 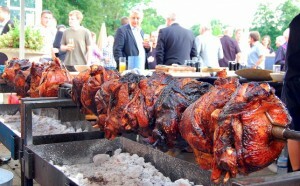 For pig roasts, we bring to your event our large custom-built above-ground hog roaster/spit-roaster. 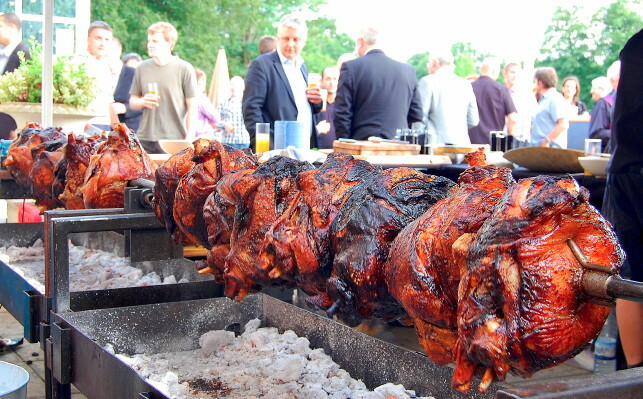 Prior to dinner service, your guests will witness a whole pig slowly turning and cooking over genuine smoking wood and charcoal! 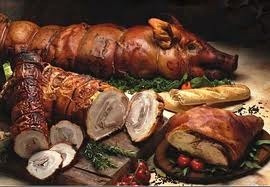 For all catered events, we use a Porchetta preparation of the pig: The pig is entirely deboned but head and tail are left intact. The inside cavity is filled with additional meat, herbs and spices and the pig is then sewn back together with butcher’s twine, placed upon a spit and slowly roasted over a bed of natural wood/charcoal. Once cooked, the pig is transferred to a large wooden cutting board, adorned with various fruits and leafy greens and served as thick crosswise slices with a special fruity honey-garlic Bad Wolf BBQ Sauce. All in all, a unique visual excitement and a fabulous taste experience! $34.95 per person. 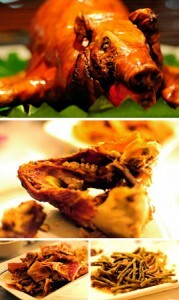 Minimum 100 guests for pig roasts.